Time to continue my Behind the Renfaire Scene! For this regular attendee of renfaires, it is fun to learn more about the other side, about those that are providing food, entertainment, and fun for the rest of us. Today we're talking with Rob Gonzo of The Motley Players III. They are regular performers at the Scarborough Renaissance Festival. He has a ton of great background info on how entertainment works at this faire. I've learned so much from his answers, and I hope you guys enjoy! 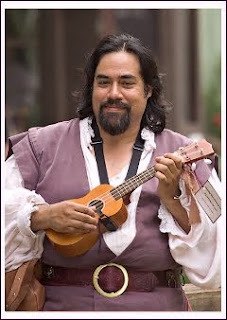 You're a contracted entertainer, tell me more about what you do at the faire? Has it changed over the 10 years you've been there? 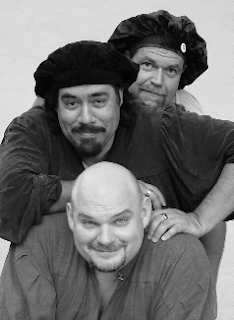 I am part of a three man comedy troupe called the Motley Players Three. We all started off as Cast and we are not the only act to come out of cast either. I guess first a little about the cast of Scarborough. The cast is mostly made up of volunteers. They give up 7 - 8 weekends to attend workshops to provide and to polish the skills needed to entertain the patrons that pass through the gates. Also, much of that training is in Improv as we rarely do scripted bits. Seven – eight weekends is a minimum. Some give up much more practicing choreographed fights and the teaching staff does a lot of pre-season planning as well. The cast is called Scarborough Academy of Performing Arts or SAPA. Not all of cast is court. In fact, as they are trying to portray a simple English village, new cast members are encouraged to develop peasant characters. SAPA has very few assigned roles. performers are allowed to develop and play characters of whatever station or background they wish; however, there is a Character Staff who's principal role is to help performers develop and grow their characters. They also have the ultimate say on approving a character concept. It wasn't always this way though. It used to be that moving from a low to a higher station was a reward for good performance and with it came perks such as not having to come into work till half way through etc. As you might expect though over time this created divisions and cliques, none of which are conducive to a cohesive cast. So that old system was abolished and a more democratic system put in it's place. This was before my time though, but I know it from many of the old timers and we have a few that have been around since Year 1. This past season was the 30th. Anyway. My two friends and I did cast for 3 or 4 seasons and then decided to make the jump to Masquer (the name for acts that perform on the stages). We started off by performing The Complete Works of William Shakespeare (abridged) by the Reduced Shakespeare Company. We broke it up into three acts and did the whole show in three parts. At some point we were given more shows than we had material for so we began doing improv comedy to fill the time. This proved popular and we dropped the Shakespeare for running improv comedy at all our shows. In order to make it interactive we also sold water balloons for people to throw at us while performing. We are beginning to phase that out though and last season only sold water balloons at one show. So yeah, it's constantly changing and evolving. Is there competition among entertainers for certain stages, show times, etc? It's hard to be competitive during the run because once stages are set, that's it. However I do know that acts do try to compete for the top stages during the off season in their proposal and contract negotiations. Are you local to Scarborough? If not, what do you do between faire weekends? We are local to the area somewhat. Scarborough is just south of Dallas, and we all live in North Dallas. It's about a 45 minute drive. But, we all have day jobs. I do know of some guys who are popular enough to have airline tickets to and from the show thrown into their contracts. The rennie community that does hang around the faire all weekend does manage to keep themselves entertained though. I know I see flyers constantly for various events, parties and benefits. I know some shows like The Texas Renaissance Festival (TRF) do provide costumes for some characters though but for the most part everyone is responsible for their own costuming. SAPA does have a Costuming staff that provides the guidelines and costume approval for cast. The Costuming staff also polices the boothies and Masquers. Though the standards are looser (which is unfortunate IMHO). What happens after the crowds leave? Immediate clean up and outta there or hang around and have parties? When the crowds leave it's usually hang out time if not outright party. Cast typically has a big tailgate in their parking area. There is also a pseudo bar in the back called the Junque where we hang out and listen to live music and stuff. I only say pseudo because they don't have a liquor license so it's BYOB. What is the most challenging part about setting up at renaissance faires? I don't know if performers have a set backstage area. In our neck of the woods it's dealing with mother nature. Our backstage gets overrun by vines and critters during the off season and every year it's a chore to clean things up again. Back behind the faire where we set up our camper it's constantly getting over grown with poison ivy and spiders. Have you worked at multiple faires? If so, which is your favorite? We've really only done our full show at Scarborough but we do go to TRF every year and do lane work on a Play for Pass basis. Lane work is what we call what cast does. Basically entertaining patrons as they walk around the faire. If you go to the Scarborough faire or are local to Dallas, be sure to check the Motley Players III out. Here is where you can find them. Readers - If there is anything you want to know more about at a renaissance faire, please let me know! This is a really interesting view of the Faire. I've often wondered what it is like to be a performer at a faire.